(1974) Bruce Liung, Shirley Corrigan, Yasuaki Kurata, Gordon Mitchell, Mario Cutini, Maria D'Incoronato. A ring of drug traffickers hire a mafia family to eliminate Interpol agents around the world. They're thwarted in their efforts by a Kung Fu movie star. Seeking revenge, they offer him a part in a new Kung Fu movie so they can lure him to his death. 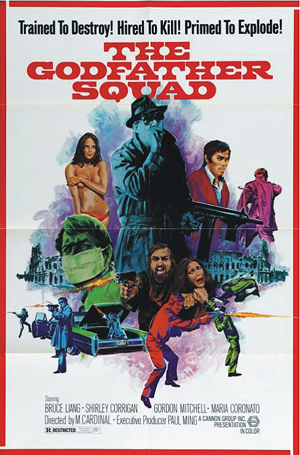 If you’re not into schlocky ‘70s martial arts films then you may not like this movie; but if you do, you’ll find this action packed title to be a rousing King Fu action grindhouse gem. Lots of fun. Nice color, from 16mm.